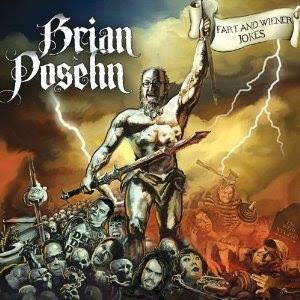 Chances are if you’re listening Brian Posehn’s “Fart & Weiner Jokes,” you’re already familiar with Posehn and his comedic take and style. “Fart & Weiner Jokes” shouldn’t surprise you. It is, simply put, Posehn at the top of his game, or in other words, one of today’s top underground (well, sort of) stand-up comedians releasing one of today’s best comedy records. It is easy as that. Posehn has never been funnier, never been so on point and on target with his humor, which consists of mostly jokes aimed squarely at himself. He makes sure to have it be known that his self-depreciating humor is warranted, constantly describing himself and his shortcomings, and as an audience it’s easy to think of Posehn as harmless, even though he is an imposing 6’6”. But still, honestly, how could you be afraid of the mail room guy from ‘Just Shoot Me?’ Most of his jokes will cause you to literally laugh out loud involuntarily, so try not to listen to “Fart & Weiner Jokes” while around strangers, or in a cubicle – just a suggestion.